We renovated it for you! The renovated house preserves the exterior, the basic arrangement of rooms, architectural details and valuable parts of windows and doors, enhancing the house's cultural expressiveness with pieces of selected and restored original interior furnishings and the presentation of found decorative paintings. For the most part, the works were financed by the European Regional Development Fund, within the Operational Programme for Strengthening Regional Development Potentials for the Period 2007–2013 and by the Slovenian Ministry of Economy within the operation »Investments in the Tourist Infrastructure of Park Škocjanske jame«. The remaining restoration and conservation works were funded by the Slovenian Ministry of Culture and the Park's managing authority. The renovation was managed by the architect in charge, Ms. Silvija Kajzer from the Linear d.o.o. firm, and conservator in charge Ms. Eda Belingar from the Institute for the Protection of Cultural Heritage of Slovenia, Regional Unit Nova Gorica. The main construction contractor was Makro5 investicije d.o.o., supervision was carried out by Elita i.b., d.o.o., while the furnishing were managed by Lesnina d.o.o. 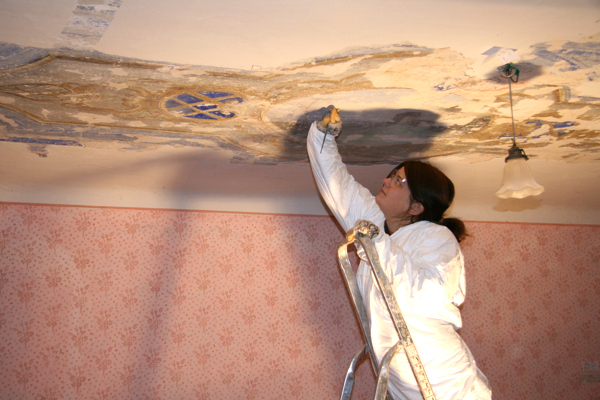 The restoration of decorative paintings were also assisted by the Restoration Centre of Slovenia, and the restoration of furniture, appointments and small tools by CRMA d.o.o. © Park Škocjanske jame, Slovenija. Vse pravice pridržane.